Bose have been venturing into the market for multiroom systems for quite a while now. But only their 3rd generation (Series III) took them to the leading group. I remember my first generation reviews: music transmission stuttered badly, it was just terrible. Therefore I'd like to start with this: The Series III system streams absolutely stutter-free. Setup is conceivably easy. There is no bridge or host needed, you simply start with one speaker. I have tested the SoundTouch 10, 20 and 30. The SoundTouch 10 is available at an affordable price and is definitely a good option to start with. Just connect a speaker of your choice to power, download the Bose SoundTouch app and follow the assistant's directions. It is always the same routine: The speaker will set up a Wifi network which you connect with. Then you enter the password for your home Wifi in the app. Only seconds later setup is complete. SoundTouch 20 and 30 come with a front display that shows a progress bar during setup. The large SoundTouch 30 is also equipped with a USB port, which can be connected to a computer or laptop for setup. The USB port can not be used for anything else. You can assign individual names to the speakers or later rename them. These settings are sort of hidden in the app: You have to tap on ''discover'' and then you find the settings when you scroll all the way down. The app itself reacts quickly and is designed neatly. Everything you set in the app is realized quickly. I find the elements a bit inflated, though: Large numbers and letters, that won't even properly fit on the screen sometimes. Although the app is really good, I am missing some features: Playback controls are not permanently visible while going though the playlists. I would prefer to see them on the bottom part of the app, where device- and volume level controls are now. And there is one rather big flaw: You cannot skip ahead within a track during playback. The timeline with a marker is visible, but it cannot be moved. What is that supposed to be good for? Later I will explain how it is possible to skip ahead or back anyway, under certain circumstances. Another example: Where is the equalizer? Bose seem to be very convinced of their speakers – the bass can be cut but you will have to take mids and highs the way they are. There is a Bose channel on YouTube that is full of ''how to''-videos, by the way, where almost every possible problem is addressed in an exemplary manner! You might want to play back music from the music app (formerly: iPod). But the Soundtouch app for iOS can't access it! You will have to switch to bluetooth mode instead and pair your iPhone with the speaker. Then you can start the music in the music app and choose the speaker for playback. This is where conventional Bluetooth streaming comes in handy and it works perfectly fine. It was no problem streaming through two walls. Yes, that's all of them. It seems unbelievable: those are all the services that Bose devices currently support. Which I find rather weak for a manufacturer playing in this league. Spotify is supported and neatly integrated but Deezer is the only alternative. SiriusXM is a service for satellite radio. New but not visible in the screenshot: Amazon Music Unlimited. I am sure more services such as SoundCloud will follow. Then again, Spotify has been integrated really well. It is basically a combination of full Spotify and Spotify Connect. 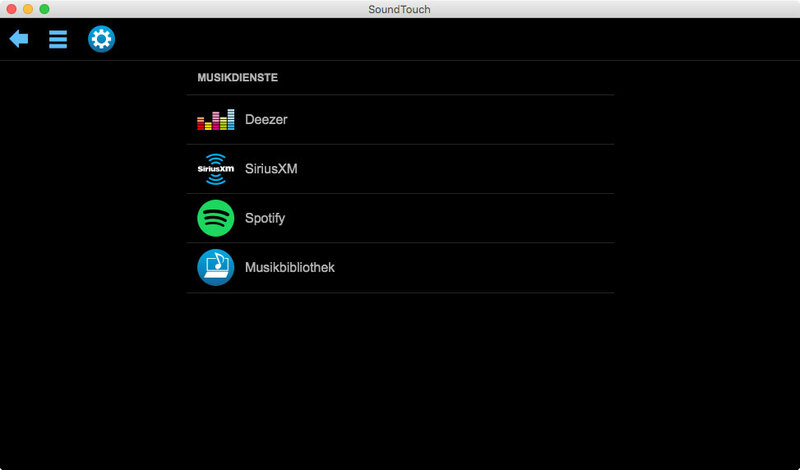 You can access your Spotify music directly through the SoundTouch app and play them back here. Or, if you like you can also use your Spotify app. 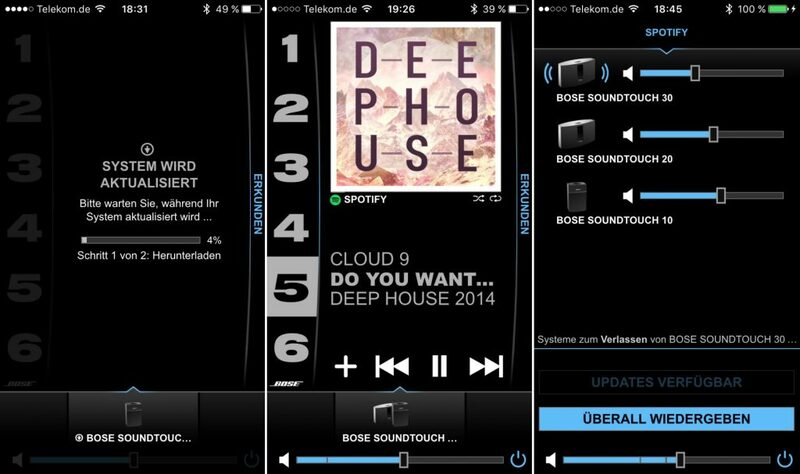 This is not possible with Sonos devices. So once you start playing music in one of the apps it will be played in the other app at the same time. And because of this you can also skip within tracks using the Spotify app. 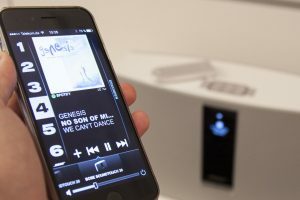 Handling of the Spotify app is much more convenient than handling of the SoundTouch app: Once you close the SoundTouch app the playlist will be closed. You always have to go through the Spotify section to get to the playlist. The Bose remote has two buttons with thumbs up and down on it: This is actually a nice feature. The thumbs up button adds the track currently playing on Spotify to ''my music'' in Spotify, the thumbs down button removes a track from ''my music''. You can set Spotify playlists to be Bose favorites. This is actually a bit confusing, though: You are assigning the current track from the playlist to the button and when you press the button the song and then the rest of the playlist will be played. But if you want to assign another song from this playlist to another button this won't work – you will have to move it to a different playlist first. Alternatively, radio stations can be assigned to these buttons. To me this makes more sense. I also like that favorites can be managed in the Soundtouch app as well as on the device. The remote control is a big advantage of Bose products. In general, the buttons on the speaker are quite practical. They can be used to switch off the speaker (stand-by), turn the volume level up and down or play favorites. The included remote control comes with even more features: It lets you ''like'' songs and skip. It is also quite handy with a good build quality. It reacts extremely well and reliably submits signals via infrared. Being used to rather malfunctioning touch screens and gesture controls, I found these more traditional controls really convenient. After all, nothing can beat the haptic of a real button. 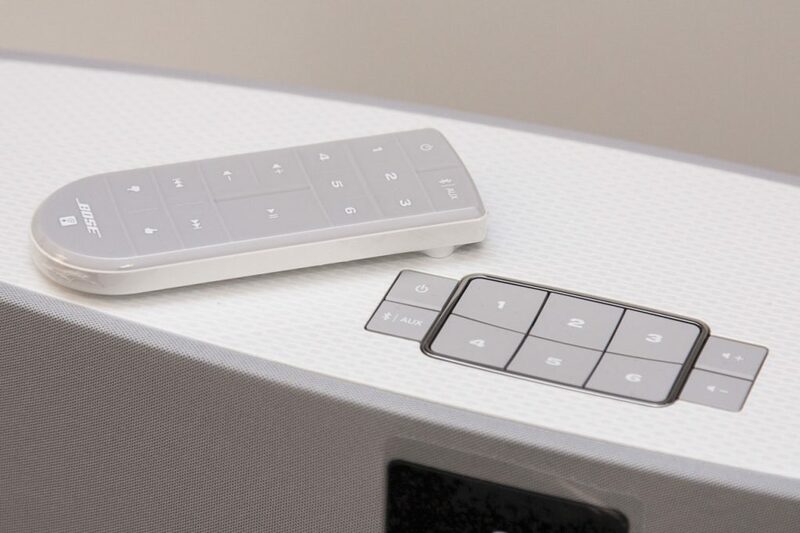 The remote controls of different models are compatible: I can control my SoundTouch 30 with my SoundTouch 20 remote. This can be a problem as soon as more than one speaker is in one room when they are not set to multi-room mode. This is what happened to me: ST20 was playing back music, ST10 was switched off. I pressed ''Off'' on the remote and playback stopped on ST10 – but was continued on ST10. That's odd, isn't it? And it was no accident, I was able to reproduce the same behavior again later. As soon as I stopped playback on the ST10 it continued on the ST20. Hilarious! In multi-room mode, when all speakers are playing back the same music, there are no problems at all! Grouping several speakers works perfectly fine and intuitively. The app displays the devices in the bottom part with miniature symbols. Here you can choose a device and start playback. Clicking the device again will open a window in which you can choose the other speakers – a few seconds later playback will start on these devices, too. This actually did not work every time. The app shows that the recently added device is playing – but I could not hear it. Regardless how long I wait. It seems to be helpful to change the volume level of both devices. This is definitely a technical flaw that leads to problems quite regularly, but once this hurdle is overcome the speakers will be perfectly in sync and stutter-free. The Spotify app can also be used in multi-room mode. First the speakers have to be grouped in the SoundTouch app and then appear as ''primary device name +''Group'''' in the Spotify app: For example, if I start playback on the SoundTouch 30 and then add the SoundTouch 20 it will appear as ''Bose SoundTouch 30 Group'' in Spotify. Multi-room functionality is even available for Bluetooth. It basically works the same way: first the speakers are grouped and then playback is started from the chosen device. You can smoothly switch between Bluetooth and Wifi – groups will be preserved. In multi-room mode it is advisable to use the app or the remote control to stop playback– that way all speakers will be stopped. If you do it directly on the device, then only this speaker will be stopped and ungrouped from multi-room mode, while the other speakers keep running. Bluetooth is switched off by default. 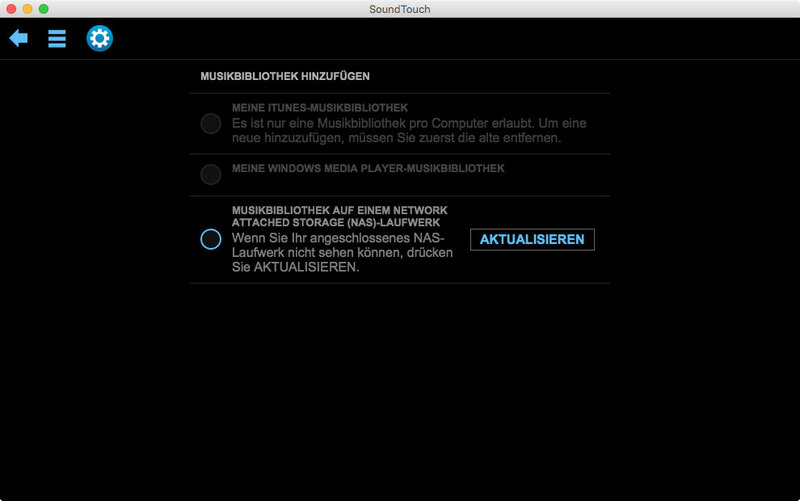 Therefore, Bluetooth mode must be selected first, just as if you select AUX input. It can't be used at the same time as Wifi. Pairing is really easy and quick. Theoretically, you can start streaming on your iPhone and then use the controls on your computer but this is not recommendable – annoyingly, the app will crash rather frequently. Other than that, Bluetooth streaming works stutter-free, while Wifi is in fact far more convenient.